An enzyme-linked immunosorbent assay (ELISA) is used to detect the presence of an antigen in a sample. The antigen is immobilized to the well of a plate by adsorption, or captured with a bound, antigen-specific antibody. A detection antibody is then added forming a complex with the antigen, if present. 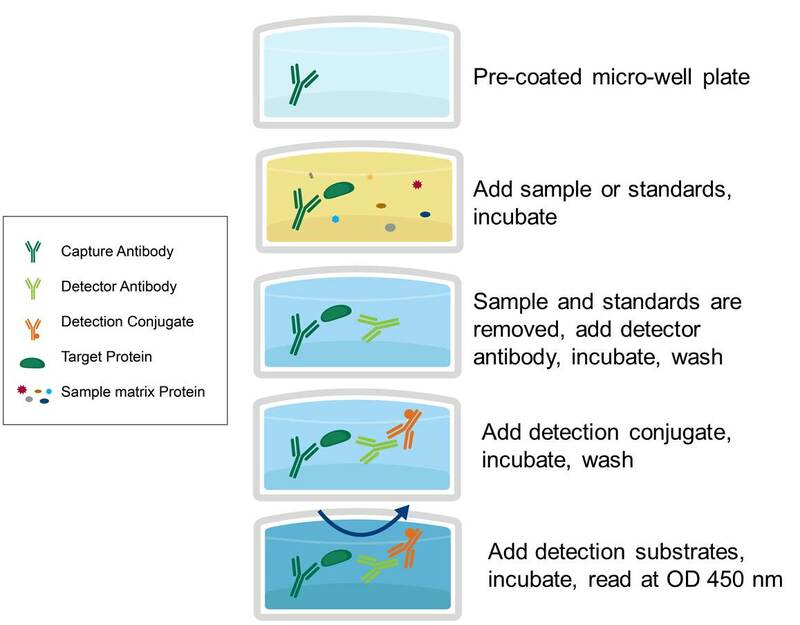 The detection antibody can be covalently linked to an enzyme, or itself be detected by a secondary, enzyme linked antibody. Enzyme substrate is then added to the wells producing a visible signal that is correlated with the amount of antigen and measured by a spectrophotometer. For general ELISA reference only. For ELISA/EIA kit-specific protocol questions, please refer to the kit instructions, or email techsupport@avivasysbio.com. - 100µl peptide (@4µg/ml) in coating buffer is added to individual wells of a microtiter plate. Incubate the plate for 2 hours at 37°C or overnight at 4°C. - Remove the coating solution and wash the plate three times by filling the wells with 100 μl PBS-0.05%Tween20. The solutions or washes are removed by flicking the plate over a sink. The remaining drops are removed by patting the plate on a paper towel. - Block the remaining protein-binding sites in the coated wells by adding 100μl blocking buffer, 3% skim milk in PBS per well. Incubate for 1 hour at RT with gentle shaking. - Wash the plate three times with 100ul PBS-0.05% Tween 20. - Add 50µl of diluted antibody to each well. Incubate the plate at 37℃ for an hour with gentle shaking. - Wash the plate six times with 100ul PBS-0.05%Tween 20. - Add 50μl of conjugated secondary antibody, diluted at the optimal concentration (according to the manufacturer) in blocking buffer immediately before use. Incubate at 37℃ for an hour. - Wash the plate six times with 100ul PBS-0.05%Tween20. - Prepare the substrate solution by mixing acetic acid, TMB and 0.03% H2O2 with the volume ratio of 4:1:5. - Dispense 50μl of the substrate solution per well with a multichannel pipe. Incubate the plate at 37℃ in dark for 15-30mins. - After sufficient color development, add 100μl of stop solution to the wells (if necessary). - Read the absorbance (optical density at 450nm) of each well with a plate reader.